As we get into September I’m becoming all too aware of how few weekends we’re likely to have left this year with the sort of sunny warm weather forecast for today so, very unusually for a Saturday, I set my alarm so I could get out in good time this morning. Despite the best laid plans, that still only meant 8.30 am, but that’s so much better than it would have been otherwise. After stretching my legs with Barnet Cyclists last week, and my trip to St Albans a couple of weeks before that, I’m gaining both in confidence and desire to cycle slightly longer distances and today I decided to go beyond Hatfield towards Welwyn Garden City and possibly on to Hertford. The main constraint on me being a 2.30 pm appointment for an eye test in Barnet. My wife did ask if I thought it was a good thing to be cycling on the roads before I had my eyes tested… ha, ha, ha darling! For the third time in recent weeks I found myself on Sustrans Route 12. It doesn’t usually take me too long to learn a route and, while it’s generally pretty well signposted, there a couple of places where it’s easy to go astray. 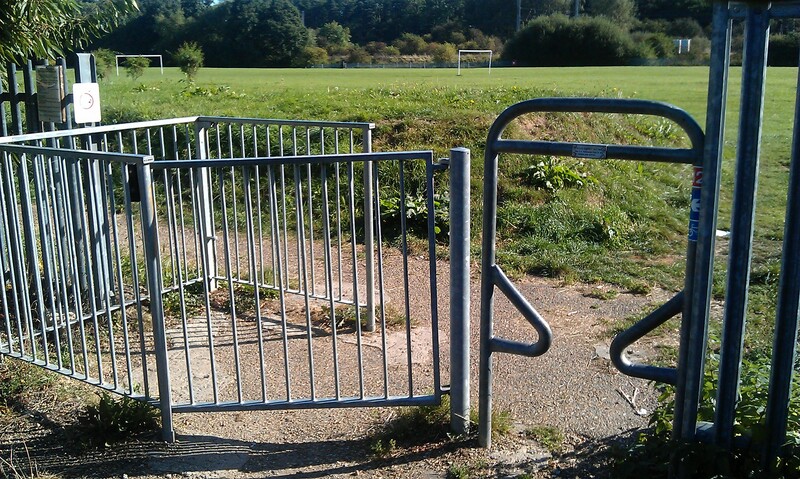 Another couple of runs and I don’t think it will be a problem, even around Hatfield, even with gates like this which I found at the end of St Audreys Close. Now I’m sure it’s terribly bike friendly for your standard upright, but there’s no way Bob can go through that gap. This time I just dug out the map, turned around back up to Travellers Lane where I turned right – on until I found Hare Lane, into Deerswood Avenue before rejoining Route 12 on Badger Way. I soon came to the crucial point where Sustrans routes meet. The last time I came to this point it was a left turn to St Albans. 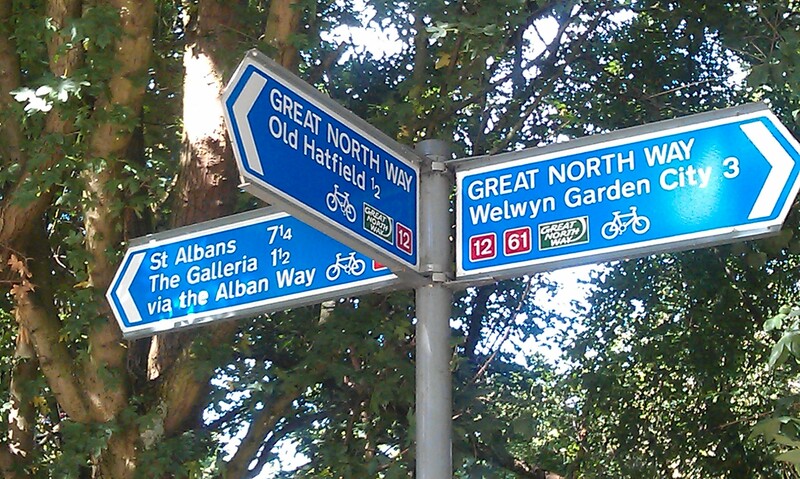 Today it was the Great North Way towards Welwyn Garden City and into what for me is new territory. Coming out of Hatfield I realised I’d shot past Hatfield House which may have been a good point for a break, but then just a little further down the road I saw a sign for Mill Green Museum. Not being in a particular rush I crossed over into Mill Green Lane and followed the gentle slope down towards the museum. Even before I reached it there was the pleasure of hearing the sound of water and leaning over the railings to look at the fish in the water below. Looking forward to seeing this working mill in action I made my way to the gates to find out that… it’s closed on Saturdays. I’ll just have to make sure I cycle out that way on a Sunday next time! Oh well, onwards and northwards. 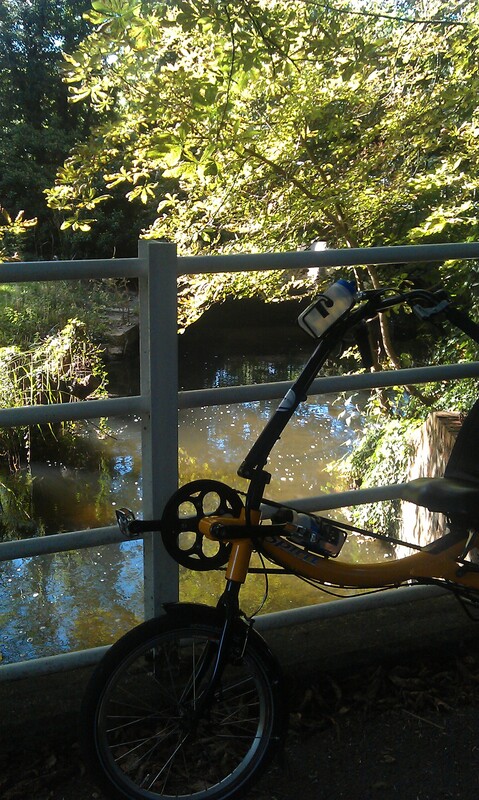 Coming into Welwyn Garden City I faced another meeting of routes. It was so tempting to turn right and head off towards Hertford and Ware, but I had been cycling for a while now and a break was definitely due. I was also well aware that I’d need sufficient time to get back to Barnet for my appointmet with the optician. So that decided it – all I needed to do was cycle the 3/4 of a mile to the town centre and get a cup of tea at somewhere that wasn’t Starbucks, Cafe Nero or Coffee Republic. Easier said tha done! Luckily I did find somewhere that absolutely ideal. I think it was called Cafe Trio which is clearly run by somebody with a love of Jack Vettriano’s paintings. Sainsbury’s was opposite with bike racks in full view of the cafe window. Friendly service, decent food and drink – I know where I’ll be going back to next time I’m passing through! While there are parts of the route which go through urban areas or alongside busy roads, there are other parts which are quiet and rural which is where the most nature treats occur. 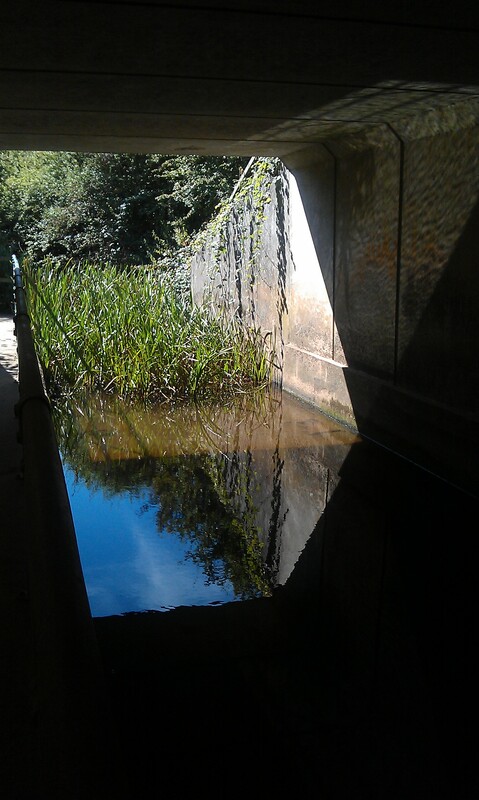 Apart from the ubiquitous bunnies scuttling off at my approach, and the fish near the mill, there are other unexpected joys in the most unlikely places such as this view from a tunnel underneath the M25! And to cap it all, just as I was making my way up towards Dancers Lance, the most gorgeous dragonfly, all bright greens and blues. I stopped to get a better look, and after trying to keep up with his rapid, darting flight I suddenly found it hovering at chest height just a couple of feet in front of me for a few seconds. Moments like that are definitely worth cycling 30 miles for! This entry was posted in Posts with pictures, Rides. Bookmark the permalink.